On an Ungrounded Earth, by Ben Woodard. Brooklyn, New York: Punctum Books. 118 pages. $12.00, paper. It might sound obvious—and a little silly—to think about it that way but the idea of philosophy being created and consumed outside of academia is a relatively recent innovation. Collapse is merely one of several increasingly visible venues publishing philosophical thought outside “philosophy departments,” many of which have hefty presences on the web. Certainly towering figures such as Nick Land, whose writings span a huge variety of subjects, and Quentin Meillassoux, whose landmark 2006 text, After Finitude, helped usher in a new era of “modern” philosophy, have had a major influence over a new generation of thinkers, writers and artists looking to construct arguments without, as Mackay put it, constraints. 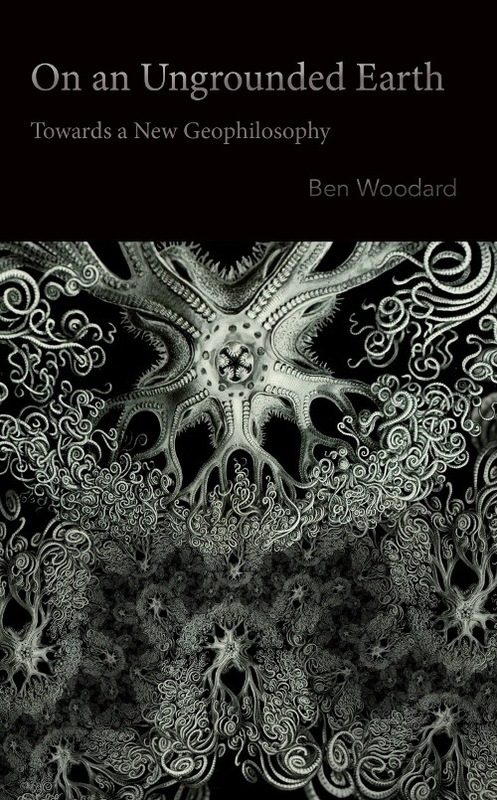 The subtitle of On an Ungrounded Earth is “Toward a New Geophilosophy.” As the back cover copy states, “In far too much continental philosophy, the Earth is a cold, dead place enlivened only by human thought—either as a thing to be exploited, or as an object of nostalgia.” One of Woodard’s contemporaries, Eugene Thacker, has written that there are three ways of interpreting the world as we know it: 1) the world-for-us, or the world in which we live; 2) the world-in-itself, or the inaccessible world which we then turn into the world-for us; and 3) the world-without-us, or the spectral and speculative world. In these terms then, Woodard’s Ungrounded Earth seeks to explore the relationship between human consciousness and the world-without-us. Arranged in five sections—and despite its relatively brief page count—the text of On an Ungrounded Earth covers quite a bit of…well, ground. Abyssal and external “ungroundings,” giant worms, the panic of burial, the “dimensions” of hell, volcanic orifices—these are only a few of the topics explored. Because this is philosophy, and so much of the text builds off of ideas and concepts introduced in earlier passages, it’s difficult to pull any excerpts without disrupting Woodard’s meticulous terminology and contextualized language. Suffice it to say, that language is approachable and articulate. I wouldn’t exactly go so far as to call it accessible, but it’s certainly very readable. Overall, an excellent balance is struck between introducing new ideas, analyzing those ideas and explaining how everything relates back to the core idea of the book. Part of that core is a deeply rooted fascination with the idea of philosophy itself, of “philosophically experiencing” the earth as we have come to understand it. On an Ungrounded Earth is one of an increasing number of texts that might be best described as speculative realism. Characterized by strong undercurrents of “anti-correlationism,” or, an outright rejection to Kant’s idea that we are limited to the correlation between thinking and being, speculative-realist texts are enjoying a good amount of attention in times of ecological imbalance and chaotic world trends. In 2013, a lot of us have spent the majority of our lives with the Internet. We have a constant supply of too much information—the anxiety of a shrinking world. We’ve long-ago accepted the idea of the universe expanding, seen a hundred movies depicting the destruction of our planet and helplessly witnessed the major religions of the world clash with one another again and again. Perhaps this is it. Perhaps whatever meaning there is to be found isn’t contained in the world-for-us. Perhaps, Woodard urges, the meaning we seek is right under our very feet—and has been for quite some time. David Peak’s most recent book, Glowing in the Dark, was released by Aqueous Books in October, 2012. He is co-founder of Blue Square Press, an imprint of Mud Luscious Press, and lives in New York City.